This is the Sanwa MT-44 FH4T/FH3 4-Channel 2.4GHz Radio System. 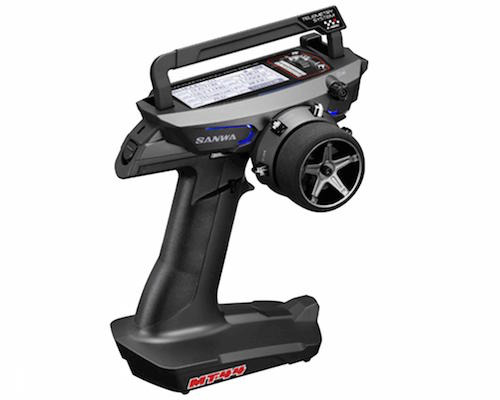 The MT-44 is the next development for Sanwa offering impressive features in a lightweight and compact transmitter. Most notably, the MT-44 is the first to use low voltage technology as it's power source, using only three "AAA" batteries for power, or an optional 1S LiPo battery. This advancement not only helps reduce overall transmitter weight, but it also helps free up size, space and comfort requirements. Other worthy features of the MT-44 transmitter include a white backlit HD display, a collapsible handle to provide full view of the LCD, USB charging, telemetry, 1S LiPo capabilities, FH4T and FH3 support. Features: High-resolution liquid crystal display Dot size equivalent to that of the M12S Optimization of steering & throttle position, even without offset bracket Industry's first low-voltage transmitter Powered by 3 "AAA" batteries (supports 1S LiPo) USB charging support Very Lightweight Quick setup function Safety link Racing mode Custom menu Supports micro SD card Telemetry switch function Clock function Environmental temperature display function LOG data CSV output Supports CODE 10 (name correspondence) Telemetry data 3 simultaneous data display Supports multiple languages ​​(Kanji compatible) Other Functions: Large Full Dot LCD Monitor White LED Backlight Fully Adjustable Trigger Telemetry function Built-in antenna body Menu selector (multi selector operation) ST, TH tension adjuster Dual rate End point adjustment Anti-lock brake function Servo speed Offset ● Trim / sub trim Servo Reverse Curve (Exponential / Adjustable Rate Control) AUX 1 (Select 3ch operation type, same function as MT-4S) AUX 2 (Select 4ch operation type, same function as MT-4S) Failsafe function (radio wave / battery) Timer (wrap / interval / down) 20 model memory (when using SD card 250 models) Model name (12 characters) Model (select / clear / copy) Direct model select Trim Type (Center / Parallel) Throttle Type (70: 30/50: 50) RF MODE setting (FH4T / FH3) Response mode setting (NOR / SHR / SSR) * Attention Key Assign (SW / TRIM / DIAL / LEVER) AUX TYPE setting CODE AUX (with name change function) Step AUX (steps 1 to 100) Point AUX (2 to 6 points) 4WS mixing (FRONT / REAR / NORMAL (in-phase) / REVERSE (opposite phase)) MOA mixing (front wheel drive / four wheel drive / rear wheel drive) * Variable drive ratio AUX mixing (ST mixing, TH mixing) Buzzer (scale and volume change) Transmitter battery alarm LCD contrast Volume adjustment Mechanical steering angle adjustment Small grip pad included NOTE: SSL (Sanwa Synchronized Link) System SANWA SSL SYSTEM When used with compatible RX-472, RX-482, Super Vortex Series, SV-Plus Series, the setting of ESC etc. by Transmitter is available through SSL functions while driving. Since the setting can be done without the stop of car, the detailed adjustment in accordance with Race conditions is available without interruption of Intervals and the change of machine conditions. RESPONSE OF TELEMETRY SYSTEM It is often said that telemetry system reduce response speed. However, SANWA Original Data Processing and Algorithm Design makes Telemetry possible without response speed reduction. Sanwa's Excellent Telemetry System has no response speed reduction. RESPONSE MODE Please do not use Analog Servo for SHR mode or SSR mode. If analog servo is used for SHR mode or SSR mode, the servo will be broken and will not work. Digital servo (SRG series, Digital ERG series, SDX series) can be used both for NOR mode and SHR mode. SSR mode can be used only by SRG series servo. 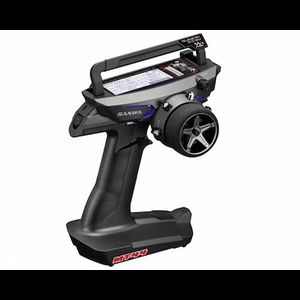 In SHR or SSR mode, BL-RACER, BL-FORCE, BL-SPORT, F2000, F2200, F3000, F3300, SBL-01, SBL-02 and SBL-03CR do not work. Please use NOR mode for the above ESC. SV-08, HV-10, HV-12, F2500 can work by NOR/SHR MODE.